Being surrounded by equipment worth more than your average college student can even fathom is incredibly daunting. Your heart still skips a beat at every hiss or beep that the microscope produces. Not to mention the fear of ramming into the pole piece while inserting the EDS detector (we later learned there was a hard stop to prevent this but it never quite seemed to alleviate the fear). It’s hard to summarize all of the experiences from our internship at EDAX this summer. While it was only about two and a half months, the sheer amount knowledge we gained through hands on experience is unquantifiable. The five day EDS training course in itself contained enough information to be taught over an entire college semester. Working with the Applications team gave us a real feel for what EDAX is all about. Not only did we get to work on a summer-long project, we also got to work with the marketing, engineering, and software teams on a regular basis. We also helped with support for the new APEX software. This work setting provided us with a plethora of new knowledge, not only of the physics and programming behind EDAX software but also of the inner workings of the company and the crucial role that teamwork plays in accomplishing tasks. Having access to an electron microscope as well as the specialized knowledge of the members of the Applications team enabled us to get the most out of our summer here at EDAX. After sitting in on a meeting with other members of the Applications team, we were exposed to some of the real-world problems faced by customers on a regular basis and decided to investigate this further with our summer project. When collecting quantification results for EDS, the ZAF matrix corrections are based on the assumption that the sample is flat, homogeneous, and infinitely thick to the electron beam. Although these are the ideal collection requirements, many customers run into problems when their samples do not meet these assumptions. We spent our time here testing the impact of ‘non-ideal’ samples on quant results while also determining ways for customers to improve the accuracy of quant results with these samples. 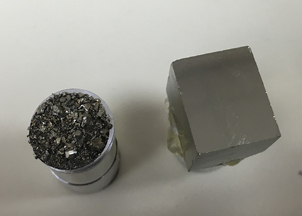 We tested samples with rough topography by scratching up and polishing a stainless steel and a pyrite sample (Figure 1). By collecting a counts per second map for the steel (Figure 2), we were able to visualize the impact of rough samples and confirm the need for sample prep. 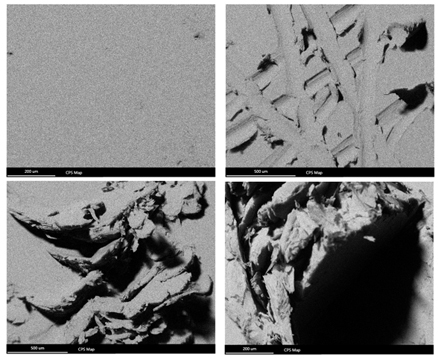 We also tested inhomogeneous samples, including a Lead-Tin solder sample and a stainless steel sample (pictured below). By collecting spectra of these samples at different magnifications, we observed the correlation between lower magnification and a higher accuracy of quant results. Finally, we tested the impact of thin samples on quant results using an aluminum coated piece of silicon. 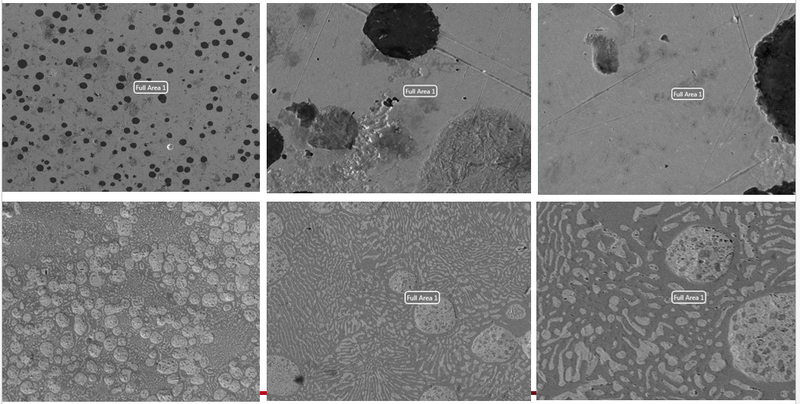 This sample was very hard to obtain, being that we had to coat the silicon five separate times, but it yielded very interesting results (see graph (left) in Figure 4 below). 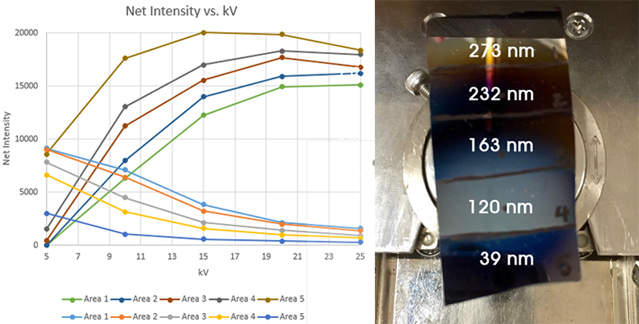 Our results illustrated the influence and importance of collecting spectra while also allowing us to back-calculate the thickness of each aluminum layer (pictured in Figure 4 (right) below). Overall, we thoroughly enjoyed our summer at EDAX and will take away not only knowledge of EDS, EBSD, SEMs, computer programming, and teamwork, but also valuable problem solving skills applicable to classes, professions, and other real-world scenarios that we will encounter in the future. Kylie Simpson: Kylie is currently a student at the Thayer School of Engineering at Dartmouth. She is participating in a duel-degree program with Colby College and Dartmouth College and is studying mechanical engineering and physics. Robert Rosenthal: Robbie is currently a student at the University of Colorado at Boulder. He in going into his junior year studying Mechanical Engineering.